The challenging design of The Word highlights the tremendous versatility of the StoVentec R system, as despite the difficulty of the application, a high standard of finish was achieved. The Word, National Centre for the Written Word - was designed by international design practice FaulknerBrowns Architects. The building’s circular design and external appearance were inspired by the way the pages of a book fan out as it is opened. StoVentec R was used to create the building’s topmost section, which complements the striking combination of glass and cladding used beneath it. StoVentec board was also used to clad the ground floor of the building. StoVentec boards are manufactured from recycled glass and although light in weight, are very strong and very flexible. They do not expand or contract with temperature change so there is no risk to cracking. The adjustable sub–construction levels out any unevenness and provides for absolutely perpendicular surfaces. Seamless façades of up to 200m² can also be achieved. The boards were finished with a 1.5 mm coat of StoSilco K, a resin-based plaster that produces a clean, white finish to complement the other aspects of the completed building. The hydrophobic properties of StoSilco help repel rain and moisture and keep the façade cleaner for longer, thus providing great weather-resistance and outstanding protection. Opening on time in October 2016, The Word represents a real paradigm shift in the community library building typology. It is a library for the 21st century, celebrating the dynamic relationship between people, books, traditional media and interactive technologies, in a truly inspiring environment. The building incorporates a library, exhibition space, FabLab with 3D printers and vinyl and laser cutters, television and radio studio, children's immersive storytelling area, OpenZone IT suite, café, and a rooftop viewing terrace with views out over the River Tyne. 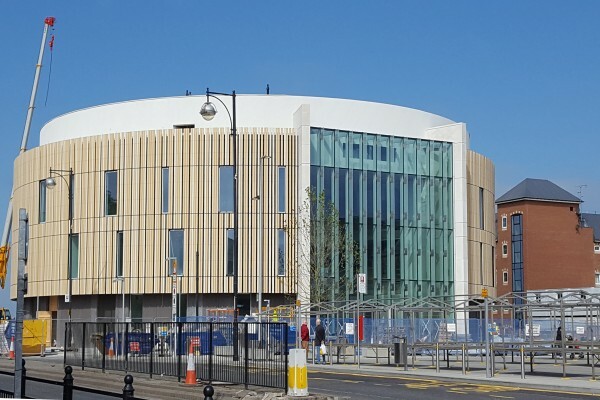 The building was commissioned by South Tyneside Council as the first phase of South Shields 365 Town Centre regeneration. The Word is vital to the wider regeneration of the town centre, creating a cultural destination which is promoting footfall and tourism back into the coastal town.